The U.S. average retail price of diesel dropped 2.1 cents to $3.261 a gallon, the U.S. Energy Information Administration reported Nov. 26, as crude oil prices continued to stay low. The drop in diesel marked the sixth consecutive weekly decline in the price of trucking’s main fuel. The price has fallen 13.3 cents during that period. Yet diesel costs 33.5 cents a gallon more than it did a year ago, when the price was $2.926, EIA reported. Average diesel prices fell in all regions of the country, led by California with a drop of 3.6 cents to $3.964 per gallon. The Midwest had the biggest drop the week before, and the second-biggest drop last week, falling by 3.1 cents to $3.185 per gallon. New England had the smallest decline, 0.3 cent to $3.344 a gallon. Meanwhile, the national average price for regular gasoline dropped 7.2 cents to $2.539 a gallon, according to EIA. The average price is 0.6 cent higher than a year ago. Average gasoline prices fell in all U.S. regions. The reason for the price slide is the flow of crude oil, said Denton Cinquegrana, chief oil analyst at Oil Price Information Service. The oil prices are all the more surprising after hitting a four-year high in October, Cinquegrana said. But a variety of factors have conspired in favor of consumers — everything from strong worldwide production to Iranian supplies not being choked off yet by sanctions. In the United States, one factor could be growing inventories adding to the downward pressure on prices. Cinquegrana said in just over two months, U.S. oil inventories have gone from a 30 million barrel deficit (based on a five-year average inventory) to a 12 million barrel surplus. Another factor is oil production, at record levels in the United States, Saudi Arabia and Russia, according to Cinquegrana. Saudi Arabia alone is pumping as much as 11.2 million barrels of crude a day, the most since the kingdom extracted its first oil eight decades ago, Bloomberg News reported. President Trump has said he supports lower oil prices and has pressured Saudi Arabia to increase supplies. At the same time, the Saudi output surge dovetails with larger-than-expected exports of Iranian oil after Trump granted sanctions waivers to some nations, according to Bloomberg News. Cinquegrana said U.S. sanctions have been temporarily lifted for eight countries doing oil business with Iran. The waiver will last six months. For now, the price of crude oil is relatively low. On Nov. 27, West Texas Intermediate crude oil, the trading benchmark, sold at just above $51 per barrel on the New York Mercantile Exchange. Daniel Jaeggi, co-founder of Mercuria Energy Group Ltd., predicted demand pressure could lead to prices double that amount, according to Bloomberg. Some analysts fret that the lower oil price, while initially a boon to trucking companies and motorists, may augur a global economic slowdown, one with less production and exploration and one with fewer trucking deliveries as companies and consumers save their dollars. The recent weakness in oil seems “to have been driven by a wider sense of impending doom amid weak equities, geopolitics, subsequent softening demand and increasing supply,” said Jack Allardyce, oil and gas analyst at Cantor Fitzgerald, speaking to Bloomberg. Traders are assessing whether the Organization of Petroleum Exporting Countries and its allies will decide to trim output when they meet early next month in Vienna. An OPEC production cut could cause U.S. diesel prices to creep up, despite lower American dependence on OPEC. 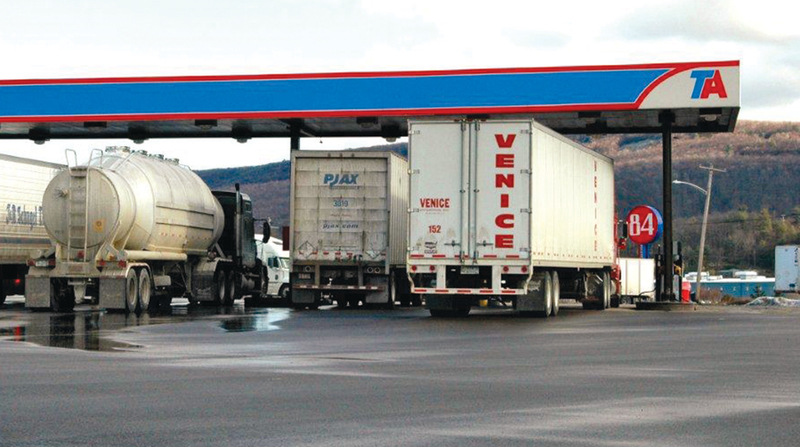 The uncertainty in fuel prices has trucking companies squeezing efficiencies where they can. Take J&M Tank Lines Inc. of Birmingham, Ala., which makes sure each drop of diesel counts. For its drivers, that means keeping the top speed at 65 mph, and no higher. The company has 450 trucks and 850 tank trailers and specializes in deliveries in the Southeast. J&M Tank Lines has three terminals in Alabama, four in Georgia and one in South Carolina. Using diesel, its trucks average about 7.2 miles per gallon, but with lower speeds and on runs with few hilly areas, the average can hit as high as 9 mpg, Lollar said. The trucks have automatic gears, and Lollar said good drivers let the trucks handle the shifting. Other ways to squeeze more mileage from a diesel gallon include the use of newer tires on older equipment to reduce resistance. But ultimately, it’s all about training, he said.